This day in London history: on 27 November 1843, Elizabeth (‘Long Liz’) Stride was born; on 30 September 1888 she became the third victim of Jack the Ripper. Stride lived in a lodging house on Flower and Dean Street, which had been built by two bricklayers, John Flower and Gowen Dean, in the 1650s. Flower and Dean street highlighted with three murder sites in red. How right the anonymous speaker (some say it was Stride herself) was: as Barnardo said, four days later Stride was found in Berner Street (since renamed) relatively unmutilated, compared with the Ripper’s other victims. She had suffered merely a cut throat and a nicked ear – due, the theory goes, that her killer was interrupted at his work by the man who discovered her still-warm body. 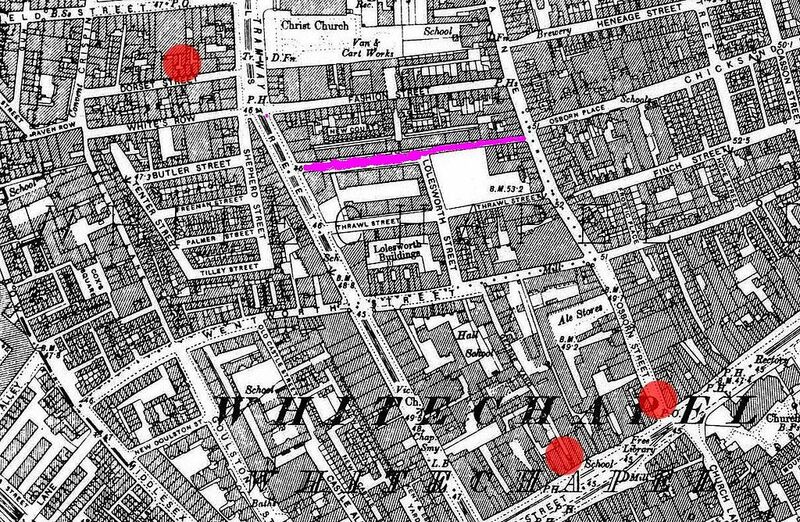 Not one to be easily thwarted, the Ripper then proceeded on to Mitre Square where he was able, uninterrupted, to kill Catherine Eddowes – who, coincidentally, also lived in Flower and Dean Street – and perform his customary atrocities.